The use of security information and event management (SIEM) as part of an integrated security management program is an information security best practice. Whether referring to security event management, security information management, log management systems, or more modern combined industry solutions, SIEM user requirements and operational considerations have evolved. 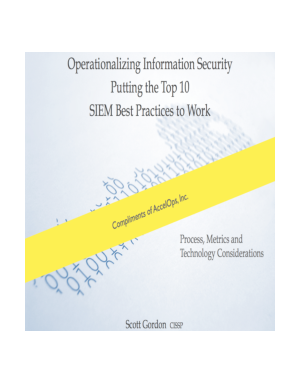 This eBook provides guidance to operationalize security and put the top 10 best SIEM practices to work, offering pertinent insights and details about how to gain more assured value from SIEM.